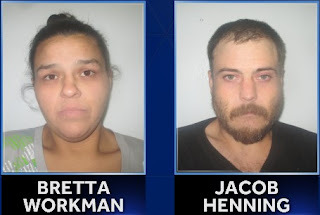 The parents of a deceased three-week old girl were charged last week in Sequoyah County District Court, Sallisaw, with the baby’s death. The mother, Bretta Workman, 26, was charged with murder in the second degree or, in the alternative, second-degree manslaughter. She entered a not guilty plea to the charge on Dec. 27, and on Wednesday the court agreed she could not afford an attorney and agreed to appoint one. She was being held in the Sequoyah County Jail without bond. The father, Jacob Colby Henning, 31, was charged with felony child neglect. He entered a not guilty plea to the charge on Dec. 27. He was released from the county jail on Dec. 21 on a $5,000 bond. Workman was arrested for second-degree murder. Blood samples were taken from both Workman and Henning at the Sallisaw hospital. Neither the results of the blood tests nor the results of the state medical examiner’s report on the deceased baby are included with the charges. Workman’s next court appearance is on Associate District Judge Kyle Water’s felony disposition docket on Jan. 17. Henning’s next court appearance is on Associate District Judge Kyle Water’s felony disposition docket on Feb. 7.